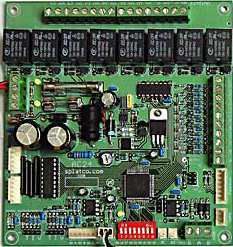 This is a unique SPLat Controller that has been specially designed for Heating and Ventilation Control. It uses the same SPLat language that you've come to know and love, complete with multitasking (32 processes for the price of one) and floating point support. What makes it special is it's focus on 24VAC compliant inputs and outputs that is the most common voltage used throughout the HVAC industry. This special focus on 24VAC means this controller can be directly installed in air-conditioner and/or heaters to control all the soleniods directly. In addition, the built-in thermistor inputs provide the most inexpensive method of accurate temperature measurement. To minimise cost, the AC24 does not include an HMI. Be happy though because a full size 20x4 alphanumeric LCD with plenty of buttons can be connected up to miles away from the controller. All you need is a minimum of 2 core shielded wire. 8 x relay outputs. Relays switch the input power high side. Each is rated 24Volts@15 Amp (resistive load). Relays are fed via one shared 6 Amp fuse. Onboard 24 VDC regulator can provide up to 600mA of power for add-on boards, external solenoids, relays etc. 2 x analog inputs can be configured for 0-10VDC, 4-20mA or direct connection of thermistor temperature sensors all at 10 bit resolution. Typically 0.1°C resolution with thermistors. Supports our large range of I/O expansion and special-purpose Xwire add-ons. Xwire expansion interface uses RS485 electrical interface for rugged communications in industrial environments. Customizable - just ask us!